Beethoven rests in heaven, while all the storms he stirred rage away on earth. But earthlings can't get enough of his music; they grapple with its complexities; they're stimulated and tormented by it. What is this 'heavenly' music that this man left behind? What possessed him? What possesses us now, as we become engaged with that divine, monumental legacy? FATHERS IN HEAVEN: Beethoven, there's someone at the gate. BEETHOVEN (busy poring over his scores): Who is it? F in H: He says he's just a fan. Your average 21st century listener. On earth. He's got all your music on CD. BEETHOVEN: Nice to know he doesn't need an orchestra and a stage. What does he want? F in H: He says he just wants to ask you a few questions; you know, sort of like an interview. BEETHOVEN: Tell him to keep listening to my music. (Pause). Carefully. It's all there. I trust those CDs don't get tired. F in H: But he insists on face to face contact, to resolve some conflicts he and the human race have had with your music. BEETHOVEN: Doesn't he know what I went through when I composed all that stuff and then lost my mind? F in H: Yes, but that's precisely what he wants to talk about. BEETHOVEN: Is he some kind of nut? The music speaks for itself. No need to psychoanalyze me. I lost my hearing, but got it back when I came up here. Now let me continue composing the way I always wanted to: with my hearing intact. I'll send down the scores so they can get a taste of more; they can preserve the posthumous Beethoven. You know, unfinished business. MODERN LISTENER: Herr Beethoven, we find it very difficult to perform your music with perfection, unless we program a computer and produce artificial tones. And even then we may fail. Our performances may be okay, perhaps even half-decent ones you might approve, but they don't quite catch all the complexities you intended; there are just too many things going on all at once. I have a CD here of your 9th symphony if you would be so kind as to give it a patient hearing. Most of us can't read a score, nor would we enjoy one if we could. There has to be a way. How did orchestras in your day sound? 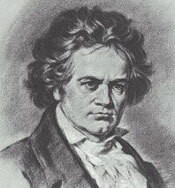 BEETHOVEN: (Reluctantly). OK, as far as I could tell. I tried to make them sound the way I heard them in my ear before I wrote down the notes. Easier said than done, I know. I thundered at the orchestra, coaxed out of them what I could as they struggled with my score, and more often than not threw up my hands in frustration. It’s a constant tussle, you know. Do I write for the instruments I know, or do I invent notes I want them to produce? As you know, towards the end, as I was going deaf, I had to put my ear to the ground to pick up the vibes, so that didn’t exactly make things easy. Listen to my Triple Concerto, for violin, cello and piano. You’ll find orchestral tuttis there that sound like breezes blowing over fields of grain, seen as an undulating motion of the stalks; as though to mimic the wave of a hand. Not just a hodgepodge of notes played in unison and in harmony by instruments but images conjured up. You know what I mean? BEETHOVEN: But let me have a look at that CD you’re waving at me. I’ll give it a listen. Hand over the gadgets I need to play it. Just wondering: who came after me? Some of them are up here with me, but I don’t see them much, nor do they talk much—maybe I’ve scared them off. I’m not exactly sociable, what with my temper, you know. I have a short fuse and can explode any time if things don’t go my way. ML: Well, actually, more than a century after you left us, a critic pointed out that only Jean Sibelius, a Finn, followed in your symphonic footsteps. I’m sure you’ll run into him some time. ML: Indeed, your symphonies and concertos are like dramas enacted on a high stage, far above mere mortals like us. They sound like nothing that came before, though we know of your association with Haydn. Some that came after you—like Brahms—tried to emulate your dramatic, nay, magnanimous style. But only Sibelius succeeded in some measure, with a series of profound works that stuck to the symphonic form. Other greats like Debussy, Schoenberg, Stravinsky and Bartok virtually abandoned it. Sibelius was a worthy successor. BEETHOVEN: I’m honored. Long live the symphony. Must meet this Sibelius fellow. You’re forgetting Schubert, though—a worthy contemporary. I always admired his lieder, and wished I could compose songs like that. There’s a touch of genius about them. He came up here a year after I did. (With great feeling). But let me say a few words about the dramatic aspect. Most of us struggle to express ourselves with words, but they fail us. I struggled with my life, wrestling with the demons inside me. How did I do it? Well, it was my music that got me through. My spirit found its outlet in those sublime notes. Every personal crisis found its answer in my work—that’s what sustained me. So the drama in the scores was inevitable, the end result of all my pain, anguish, tortured mind, colossal conflict, euphoria, call it what you want. Is that surprising? ML: I suppose not. A lot of composers today could use that attitude—if only they felt such Dionysian upheavals. Just an example: in your Third Symphony you begin with those bold jabs in E-flat major. But a few bars on you tempt the listener by leaning, straying into a minor alley as though you’d lost your way, then you wander onto the broad meadows of F-major before returning to the E-flat major highway. Most of us can ‘hear’ these key changes, though we can’t identify them by name. The composer-conductor, Leonard Bernstein, who reveled in looking for deeper meanings behind the scores of great composers, did a wonderful analysis of these opening bars, trying to throw some light on the workings of your mind. Any reason for teasing us this way? BEETHOVEN: What can I say? Let me ask you this: Don’t you like the excursion? ML: Well, yes. It’s quite a surprise. BEETHOVEN: There you are. What’s music without an element of surprise in the way it unfolds? ML: Is the drama of the Third about Napoleon or about you? BEETHOVEN: (angrily). I’ve said this before: it’s to celebrate the memory of a great man. Does it really matter? Study the notes and make up your own mind. You should know by now that I never composed like Haydn or Mozart, who had the Princes and rich folk in mind. I did it for myself, and I think it shows. ML: How true. Your music is certainly not intimate the way Mozart’s is. It often seems monolithic, intimidating; not on a human scale. It speaks the language of the Gods. BEETHOVEN: Big words. But I think you’ll agree that I was at least human. Maybe with fires raging in my mind, tormenting me every waking moment. But still human. And human beings like my music. One more thing: I raised the level of the instrument to match and surpass that of the human voice. ML: Yes, I’ll grant you that. Perhaps I should change the subject and get a bit critical. ML: The composers who came after you were quite inventive. Pardon the big words but I’m thinking of Debussy, who ushered in his atonal chromaticism in works like the Prelude à l’après midi d’un Faun; Mahler, with his rich tonal color; Ravel, with his own brand of atonality. And of course Bartok, with his idea of ‘pure’ music, shorn of any reference to the real world. He relied very little on externals to drive a musical composition once it was set in motion. And that stands to reason: music speaks for itself and has an intrinsic value, its own grammar, that's not dictated by extraneous elements—or shouldn't be, as Bartok believed. He tried to practice music in its purest form; he tried to give his music an internally consistent frame of reference—each phrase ought to sound like there could be no other at that time. BEETHOVEN: Stop right there. These men stood on my shoulders. It’s easy to jump off or look down when you’re on the summit already. But very hard to climb or leap to the top if you’re down in the valley looking up. OK, so maybe they’ve gone ahead of me, or extended my work, but they couldn’t have done it without me—my contribution was necessary to their work, even an integral part of it. Take Einstein, who’s up here with me. He always points out how he stood on Newton’s shoulders—the General Theory of Relativity, having to do with gravitation, may not have occurred to anyone without Newton’s foundation: his universal law of gravitation. I guess you could say I was the Newton of Music. I changed the grammar and so brought something new into the world. As you say, people still listen to it. Love it or hate it, they find it hard to be indifferent. Right? ML: Absolutely. In fact, let me elaborate. You’re known in every household, musical or not. Your name has become iconic. The response is often one of ‘shock and awe’. Take your Fifth Symphony, with those opening bars. Probably the boldest statement in all of music. Guaranteed to wake up even a drunk or stimulate the most jaded soul. BEETHOVEN: All intended, I assure you. ML: Again, Bernstein pored over your sketches, especially the rough sketches of the opening and closing bars of the Fifth, leading to the notes you eventually settled on. He even took the trouble to get the orchestra to play those rough sketches, and figure out why you chose the specific phrase you did. He kept emphasizing that you cared deeply about the inevitability of each note following the previous one—there would be no sloppiness, no compromise, even though each choice may’ve passed muster among the cognoscenti. And most important, there would be that logical drive to build one upon the other, right to the very end. BEETHOVEN: This fellow, Bernstein, must’ve had some sleepless nights! I know I did. ML: Believe it or not, they even created a robot that conducted your Fifth Symphony in Tokyo recently. Indeed, when talking music the ‘FIFTH’ is instantly recognized as your symphony and not someone else’s. The same way billboards in Las Vegas shouting “Frank’s in Town” were meant to announce that Sinatra was playing there. But he’s 20th century pop. You’re 18th-19th century classical; Berlioz and Schubert were your contemporaries. Yet your music is contemporary by virtue of its sheer presence in our lives. Those bars can be heard everywhere—in ads, remixes, background scores for films and theater, muzak. You name it. BEETHOVEN: It’s music to my ears. Go on. ML: But no work of yours has passed into the consumer culture like that ubiquitous piano solo piece, Fur Elise. It is used in everything from ringtones for mobile phones to car alarms to on-hold music to elevator muzak. That’s how distinct your melodies are. Not too long ago the opening bars of your Third Piano Concerto were used in the opening of a Marathi play. Quite remarkable. Your music keeps speaking to us in countless ways. There seems to be no end. It keeps maturing with age. Like a good whiskey. BEETHOVEN: I see what you mean. I’m flattered. ML: Sorry to have wasted your time. I’m almost finished. BEETHOVEN: No, no. I’m enchanted by the effect my music has had on you moderns. Take all the time you want—I’m not going anywhere! I have to worry though that you’re in danger of canonizing me. ML: OK, let me get a bit sentimental. You know, we have no photos of you, just drawn portraits. You passed away before Daguerrotypes could be made. BEETHOVEN: Well, you can see me now. Take a good look. ML: With such a larger-than-life reputation, it’s hard for us mortals to imagine you as a regular citizen going about his daily business. Especially when your genius soars in those immortal scores. Your love life, your fights with publishers make you seem mortal to some extent. But in the end it’s your music that stands above all the mess and clutter of life. Isn’t that what we all want? BEETHOVEN: You really are obsessed with my ‘image’. Didn't a famous thinker who came after me say that Newton was miserable as a human being, but as a monster he was superb? ML: Yes, I think it was John Maynard Keynes. BEETHOVEN: Well, you could say I sort of fit that description. But just as Newton was revered for his ground-breaking science, I’m grateful for the exalted place given to my music. Who wouldn’t be? But let me repeat what I said once: the barriers are not erected which can say to aspiring talents and industry, "Thus far and no farther." ML: (to the audience) Someone might just come along who may be considered the Beethoven of genetics, the current obsession. (to Beethoven) I should go now. Got a deadline to meet. So long, maestro, I’ll be back to prod you some more if you don’t mind. BEETHOVEN: By all means. Look forward to it. Can’t wait to feed into my posterity. It’s great to be alive—forever. What more could anyone want? (Gets onto the podium with his baton to conduct a fresh work). ML: (shouts out loud as he exits) Long live Ludwig. Hallelujah!